UK Moto G gets KitKat one day before it announces Moto X coming to Europe? One year ago, I’d have been more likely moaning about the time taken by Motorola to roll out a new Android update, or the fact that the company had decided to stop upgrading a device completely. Not praising it for delivering an update so quickly. In September 2012, Motorola launched the excellent Razr i, with the promise of an update in the new year (which then followed many months later). The year before, it was the large-screened, yet waif-like, Razr, again with a promise of an update in the new year – which came around September. Motorola once had a policy of giving every new release just one major update, rather than supporting a phone or tablet for at least 18 months as recommended by Google. It was a horrible policy, and saw many otherwise great smartphones and tablets being left in the gutter long before their time. Not everyone has the time to install custom ROMs, or even the desire to do so. All of this left a lot of people with a very bitter taste in their mouth, with many people stating on tech sites and forums that they’d never buy a Motorola product again. I really hope this is now a policy that has been kicked to the kerb by its new owner, Google. With the launch of the awesome Motorola G (read my review here), things certainly seems to have changed for the better. Motorola even delivered ahead of schedule by rolling out Android 4.4 (KitKat) to US customers before Christmas. The good news is that today (well, last Saturday for some lucky owners) sees KitKat rolling out on the UK Moto G (and other European models), and bringing with it a range of new features. What Motorola needs to do now is keep those updates coming from now on. That will mean further updates (like patches) being released without delays too. And when 4.5 is announced? Motorola will be announcing its introduction within weeks, not months – and certainly not messing people around by saying it’s ‘under review’ before quietly moving on to the next handset release. Do this and anyone that has been boycotting Motorola over its previous decisions will hopefully feel confident to buy again – and given the quality of the Moto G and my high-hopes for what 2014 will bring, that’s exactly what’s needed if Motorola is actually going to succeed. “When we launched Moto G to the UK market in November 2013, we committed to delivering Android, KitKat, to devices by early 2014. We’re thrilled to start delivering on that promise. Over the next week we are officially rolling out Android 4.4.2 to Moto G phones – starting today! This latest version of Android brings some cool new features, including printing emails and photos from your phone. We’re also happy to let you that Moto G will soon be coming to a Vodafone shop near you. Android 4.4, KitKat Android 4.4.2, KitKat, is the latest release of the Android platform. KitKat includes enhancements such as restyled status and navigation bars, a new full-screen mode, color emoji support, improved closed captioning support, stronger security, smarter power use, and more tools and capabilities for better app development. Phone dialer Improved the phone app with the ability to look up contacts directly from the dial pad, see and tap frequent contacts, and search your corporate directory easily. Gallery – Photo editing Added new photo editing options to the Gallery app including new filter effects, draw on your photos, advanced cropping, and adjustments to color, exposure, contrast and more. Printing documents and pictures Added support for printing photos, Google Docs, GMail messages, and other content via Wi-Fi, Bluetooth and hosted services like Google Cloud Print and HP ePrinters. Hangouts – SMS/MMS support Incorporated a new version of Google Hangouts that supports integrated SMS/MMS messaging. Hangouts can be set as the default SMS app under Settings > Wireless > Default SMS app. Accessory support Added support for Square credit card reader. 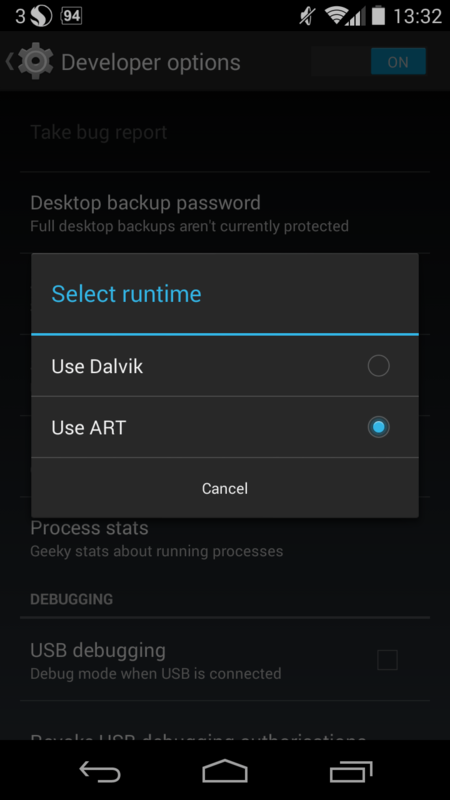 One other feature that the Moto G gets as part of Android KitKat is the ability to change the Java runtime, from Dalvik to ART (Android RunTime). Tap on ‘Build number’ (at the bottom) repeatedly until it activates. Go back one level and you’ll now see ‘Developer options’. In that menu, find ‘Select runtime’, tap, and select ‘Use ART’. Agree to reboot (which might take some time, so don’t do it if you’re expecting a call!). Before you do that, however, be aware that some apps won’t necessarily work well (or at all) with ART. That’s why it’s a hidden option! A list of apps that won’t work on ART can be found here. Fortunately, most will work and more will be compatible as time goes on. Ultimately, it will replace Dalvik completely in the future. I’ll save writing about the differences or what a runtime is (because I’m not a programmer) and why you might wish to change, and link to a site that explains it better than I could instead. I switched to ART on my Nexus 5 and immediately saw an improvement on app loading times (for those that require a runtime) and battery life, as well as a feeling that the whole phone was quicker in its operation. Give it a go, as you can easily switch back to Dalvik if things don’t work out. Other news: Moto X making its European debut this week? On Tuesday (January 14th), Motorola is to make another announcement that could see a version of the Moto X coming to Europe, including the ability to customise your phone before ordering. I’ll be at the event in London and will report back on this and any other interesting news in a separate story, so please check back or use the link on the right-hand column to follow my blog.